ABB is an attractive industrial automation company that operates out of Switzerland and trades on the New York Stock Exchange under ticker (ABB). To get a feel for the organization, consider its main operating segments, as described in the following graphic. For more perspective, The Electrification Products segment produces and markets products and services including electric vehicle charging, solar inverters, `modular substation packages, and switchgear. The Robotics and Motion segment manufactures and sells robotics, motors, generators, drives, wind converters, components and systems for railways and related services and digital solutions. The Industrial Automation segment integrated automation and electrification systems and solutions. Aside from the attractive 4.3% dividend yield (which we will cover later), the other main reason we are attracted to ABB is its compelling valuation. For perspective, the following table shows ABB valuation multiples versus its own historical levels. ABB currently trades below its historical level on a variety of important metrics (i.e. the price is lower than it usually is). Aside from the attractive Price-to-Earnings ratio (P/E is important for long-term value stocks like ABB), we like the low PEG ratio because it shows the market may not be giving ABB nearly enough credit for its expected growth (i.e. the shares have upside). But before getting into growth opportunities, here is a look at the aggregate rating from the 29 street analysts covering the stock (they believe the shares have 12.7% upside, and they notoriously too short-term focused and miss the longer-term potential, plus that conservative 12.7% upside is in addition to the attractive dividend yield ABB pays). One of the attractive things about ABB’s valuation is that there is room for multiple expansion, meaning the share price can increase even if earning don’t increase because they’re valued too low. But even more attractively, ABB is expected to grow, as we’ll see in the next section. The following table shows ABB’s sales are expected to increase, across segments, in the years ahead. And this isn’t wild speculative growth (ABB is an established business with strong competitive advantages, which we’ll cover later). And not only are sales expected to increase across segments, but EBIT margins are also expected to improve. For example, here is a look at how management broke it down in the latest earnings presentation. Not only does ABB have an attractive valuation and room for growth, but it also has a very attractive dividend supported by lots of cash. And in particular, the dividend yield is now higher than it normally is (as we saw in our earlier valuation table) which is NOT a sign of distress but a sign of attractive value in the case of ABB. Not only does ABB have a strong “single A” credit rating, but it also has plenty of extra cash to support the dividend, share repurchases and important capex, as shown in the following “uses of cash” graph. And for more perspective, here is a look at ABB’s healthy cash returns and capital allocation. Obviously, there are risks to ABB that should be considered. For one, a significant portion of the business is significantly cyclical, which means the share price could cycle through periods of relatively weak and strong performance. The good news is that the business may be closer to the low end of the cycle than the high as the valuation is uncharacteristically low and growth is starting to ramp up again. Another risk is simply the one-off idiosycrasies that go along with owning any single stock (this is why we diversify with a portfolio of stocks). For example, ABB recently disclosed that it lacked effective internal controls over parts of its financial reporting. And even though this did not lead to any financial misstatements or a need to restate numbers, there will always be company-specific risks (that can largely be diversified away by owning names like ABB as part of a larger investment portfolio). Another risk is that the market could continue to favor aggressive growth stocks instead of conservative attractively valued healthy dividend payers like ABB. It seems likely that the growth stock dominance will eventually slow, and ABB style stocks will rise (no one can predict the future, but it seems value stocks are overdue for a strong outperformance rally). If you’re not keen on the idea of volatile zero-dividend growth-stocks, you might consider ABB instead. This industrial automation company offers an attractive well-covered 4.3% dividend yield, and the shares are valued attractively with significant upside potential. In our view, not only is ABB attractive for the reasons described in this article, but value stocks (like ABB) are overdue for a rebound versus growth stocks anyway. 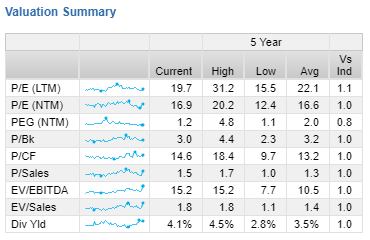 We’re adding ABB to our watch list, and may purchase shares in the relatively near future.